School Lunch Healthy Habits Part 2 | Audio and video stories from Southwest Washington. The school-age years are the most influential years for children to begin establishing the eating habits that will likely stick with them for their entire lives. The risk for developing chronic diseases can be hugely decreased by simply involving our kids in healthy decision making while they are young. One of the best opportunities to equip the next generation with these life skills is to teach them to pack their own school lunch. Children are far more likely to not waste a lunch that they have chosen and the lessons learned in packing healthy portion sizes, planning ahead, and developing appreciation for those preparing food are invaluable. Mom and dad also gain an additional 15 minutes to focus on other items! We as parents need to be educating ourselves in order to teach our children but this simply requires a desire to continuously familiarize ourselves with the basics of nutrient-rich whole foods. It can be as simple as learning that real peanut butter should list only “peanuts” in the ingredients and encouraging our children to find the shortest ingredients list instead of the standard American “peanut spread” of hydrogenated trans-fat oils, sugar, vegetable oil, and some peanuts. Wherever you are in your current habits at home, a brand new school year has only just begun, and with that is a fresh window of opportunity! Frenzied mornings are no fun for anyone so throwing things together in the morning usually results in convenience trumping healthy choices. Depending on your family schedule, my sisters and I were most successful in making our lunches in the evening, which is ideal if questions on food preparation arise and parents are nearby to assist. If home packed lunches are brand new to your family, start small by bringing lunch from home just twice a week—once made by you and once made by your children. As the routine becomes more familiar and your healthy habit is better established, add one more day to the week and continue until it becomes the daily norm if you are able. If your children are already taking a homemade lunch you have made, begin small by including them in making their own lunch once or even twice a week, such as Tuesday and Thursday. The task may require more patience and assistance at first but will require no more than a quick 15-minutes maximum each evening. Over the weeks your child will grow more familiar and develop a greater sense of discipline, ownership, and appreciation for contributing to family responsibility. School Lunch Healthy Habits Using a Lunch Chart Strategy Plan! 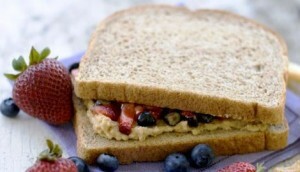 Mental roadblocks are the primary reason home packed lunches seem unrealistic for an already crazy family schedule. The benefits of packing a lunch are already well understood—they are generally much healthier, more economical for the budget, and overall wholesome in every other sense. 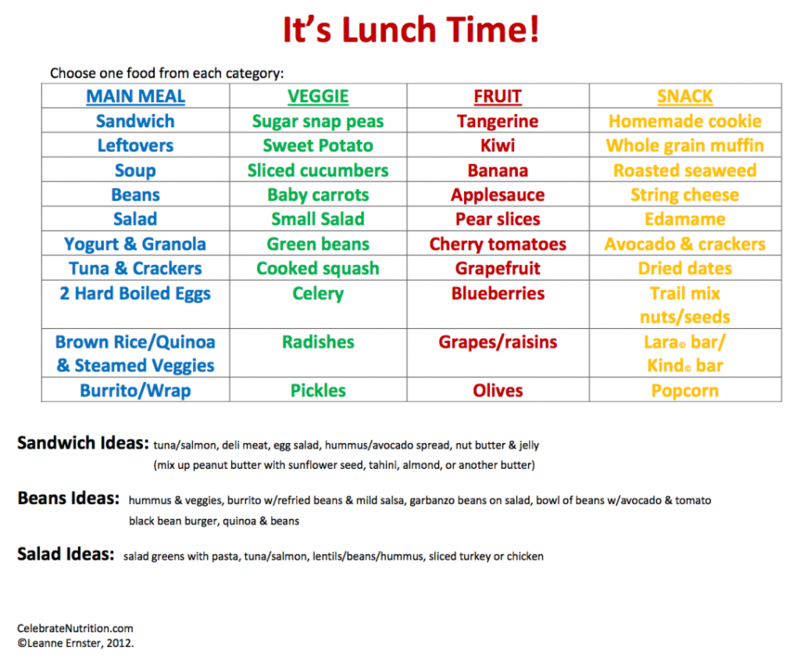 My best advice for a quick and easy action plan of ideas is to use a lunch chart of categories with food options, as kids are highly visual and it sets the tone for some balanced guidelines. I am sharing an example chart of mine with you below but you can be creative by personalizing your own chart depending on your family’s food preferences, your children’s ages, and taking into consideration any food sensitivities or allergies. Print the chart off and ask your child what they can about it. Always shoot for nutrient-rich and whole foods. A tangerine, for example, is always a more nutrient-rich, whole food than a pasteurized juice box. Post your chart on the fridge or pantry door for easy access. A main course, fruit, vegetable, and additional snack item is simple yet completes the task well.